Update: We’ve added a mirror for the API17 (Android 4.2+) version in addition to the API18 (4.3+) version initially posted. Update 2: Thanks again to Senior Member MihirGosai for providing us with the last APK for Android 4.0+ (API14). What in the world!? Two first party Google application updates on a day other than Wednesday within the span of one week? Last Friday, we saw a major update to Google Drive that removed its built-in editing capabilities in favor of integration with the newly released Docs and Sheets apps. Now, the Google Maps team has just released a significant update to their mobile app, delivering quite a bit of added functionality. 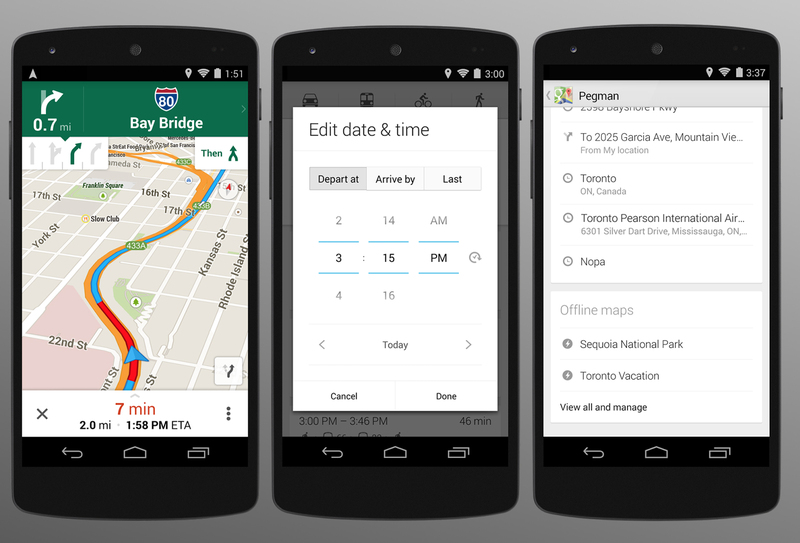 First and foremost, Google Maps 8.0.0 finally offers lane guidance. There have been rumors for quite some time that this feature would be added—and with v8, it’s finally here. The lane guidance feature isn’t quite as graphically rich as it is in most standalone GPS units. Rather than visualizing the lanes in faux 3D, maps shows you an indicator on the top left hand portion of the navigation screen that guides you through complicated intersections. Currently, this feature is available only in the US (highways and local roads in major metropolitan areas), Canada (highways), and Japan (non-highway roads). Next up, we have offline maps management. For those who don’t remember, we lost the ability to easily manage offline maps back when Google Maps 7 was released last July. Understandably, this prompted many users to revert to an older version of Maps. Luckily, today’s update brings a great new UI for offline maps management that allows you to “Save map to use offline.” You can then manage this saved map by tapping on your profile icon within the app and then selecting the predefined name of your saved map. In addition to lane guidance and offline maps management, this new update brings a few smaller features. For example, the new filters feature allows you to only view locations that meet your criteria such as rating, price, open hours, and if someone in your circles has reviewed it. In addition, Maps 8 can also compare your Uber routes with the transit and walking directions from within the app itself. And on the topic of public transportation directions, Maps 8 now gives you more options to planning routes on public transit. This includes the new ability to specify departure and arrival times (just like the web app), as well as search for the last transit option of the day. You can read more about the update on the official Google Maps blog, as well as the app’s Google Play listing. What’s your favorite Maps 8 feature? Let us know your thoughts on Maps 8 and its new features in the comments section below!